A perfect spring salad that will work it’s way into the summer grilling season with ease. We’ve been experimenting with different grains lately – this salad uses farro, which cooks up a lot like barley, but really any grain would work fine. One thing I’ve found is that these types of salads make a great healthy snack, or quick meal, when left in serving sized containers in the fridge. Stir to combine and adjust seasonings to personal taste. This is so pretty…the colors are beautiful! I love when all the fresh produce is available and we can eat so many more dishes like this. Thank you for sharing your recipe! Wow, the colors really do pop on this salad. 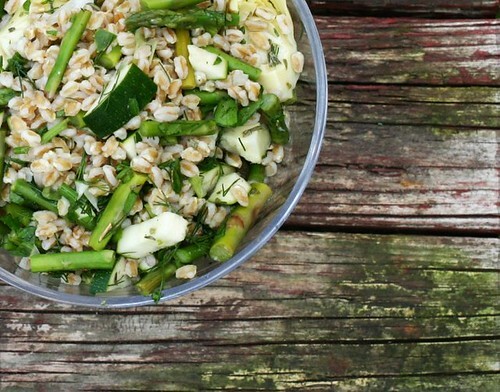 I love farro; this is a great salad. This is totally something I could make on a Sunday and take to work for lunch throughout the week. Thank you for the recipe. 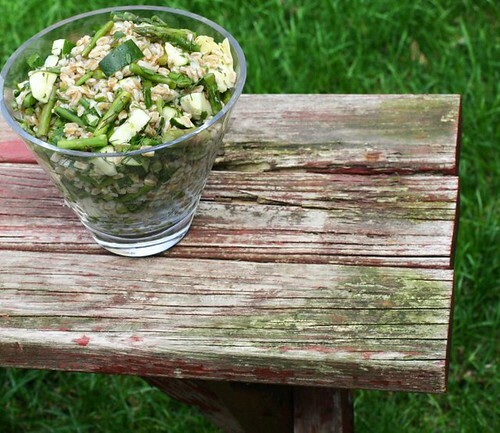 This farro salad looks delicious and healthy. Thank you for the recipe! Farro is amazing and I’m proud it’s tuscan…just like me! When readers ask me what to do with it I say – “think of pizza – what can you top it with?” that’s just the best way in which to use farro – hot or cold – use your imagination…just like you did! The result will be fantastic! Oh boy this really looks good! Lots of vegetables and whole grain, my favorite! This looks yummy, and I have most of the ingredients growing in the garden, I will try it!